Scientists at the Johns Hopkins University Applied Physics Lab have developed a new, environmentally friendly paint made from glass that bounces sunlight off metal surfaces — keeping them cool and durable. To address that aspect in a new coating, Benkoski, started with silica, one of the most abundant materials in the earth’s crust. 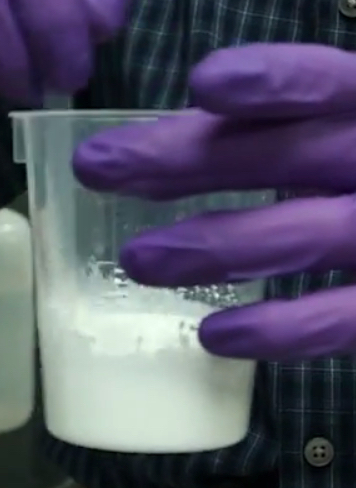 He modified one version of it, potassium silicate, that normally dissolves in water. His tweaks transformed the compound so that when it’s sprayed onto a surface and dries, it becomes water-resistant. The paint Benkoski’s lab is developing is intended for use on naval ships (with funding from the U.S. Office of Naval Research), but has many potential commercial applications. Benkoski says he expects his lab will start field-testing the material in about two years. The researchers presented their work today at the 250th National Meeting & Exposition of the American Chemical Society (ACS), held in Boston through Thursday. It features more than 9,000 presentations on a wide range of science topics. Solar exposure is a leading cause of material degradation in outdoor use. Polymers and other organic materials photo-oxidize due to ultraviolet (UV) exposure. Even in metals, solar heating can cause unwanted property changes through precipitation and Ostwald ripening. In more complex systems, cyclic temperature changes cause fatigue failure wherever thermal expansion mismatch occurs. Most protective coatings designed to prevent these effects inevitably succumb to the same phenomena because of their polymeric matrix. In contrast, siloxane coatings have the potential provide indefinite solar protection because they do not undergo photo-oxidation. This study therefore demonstrates UV-reflective siloxane coatings with low solar absorptance and high thermal emissivity that prevent any increase in temperature above ambient conditions in direct sunlight. Mathematical modeling suggests that even sub-ambient cooling is possible for ZnO-filled potassium silicate. Preventing widespread adoption of potassium silicates until now has been their tendency to crack at large thicknesses, dissolve in water, and delaminate from untreated surfaces. This investigation has successfully addressed these limitations by formulating potassium silicates to behave more like a flexible siloxane polymer than a brittle inorganic glass. The addition of plasticizers (potassium, glycerol), gelling agents (polyethylenimine), and water-insoluble precipitates (zinc silicates, cerium silicates, organosilanes) make it possible to form thick, water resistant coatings that exhibit excellent adhesion even to untreated aluminum surfaces.